Pupils from a primary school in Carmarthenshire are on a mission to find a new lollipop person – having been without one for nearly a year. Tycroes County Primary School last had a school crossing patrol (SCP) in April 2017, and recently held a banner competition in a bid to help fill the post. 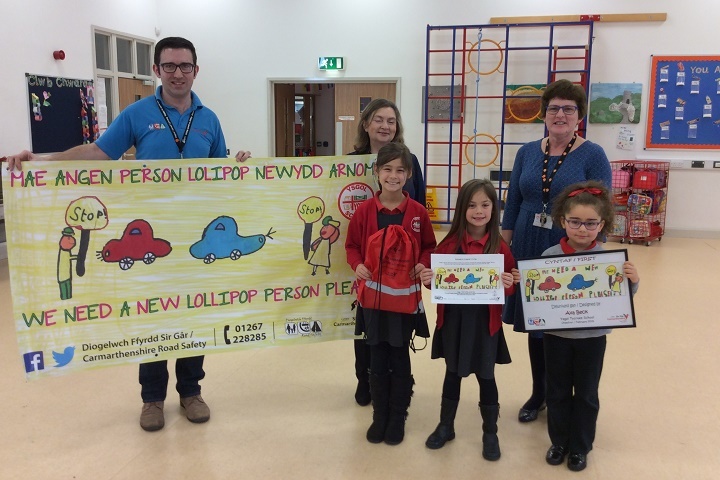 The competition, which was judged by Carmarthenshire Council’s road safety team, was won by Year 2 pupil Ava Beck – whose banner is now draped over the school gates. The winner, along with the two runners-up – Aliyah Beck (Year 4) and Jada Findlay (Year 1) – all received a road safety goody bag. 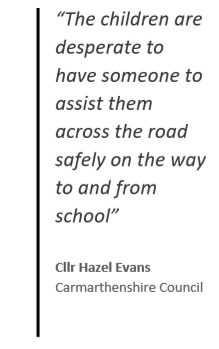 Cllr Hazel Evans, Carmarthenshire Council’s executive board member for transport, said: “The pupils wanted to get involved in an appeal for a school crossing patrol and this competition was a perfect opportunity for them to do that. “We’re hoping the banner will encourage people to come forward and apply for the post as the children are desperate to have someone to assist them across the road safely on the way to and from school. The council is also seeking patrols for schools in Kidwelly, Drefach and Ffairfach, as well as casuals to cover many areas across the county.